In the United Arab Emirates, the sky isn’t the limit – it’s a goal. Home to seemingly infinite wealth and some of the world’s most mind-staggering architecture, this federation of oil-rich regions speaks to travelers for whom the very best is but a good place to start. Discover the busy, always-changing cityscapes of Dubai and Abu Dhabi with us on this unique journey to the heart of Middle Eastern opulence. 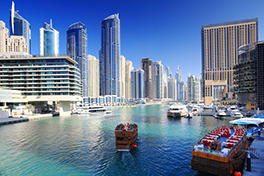 It all begins in Dubai, the flashiest and most famous of the Emirates, with a full-day privately guided tour of the city’s ambitious, gravity-defying architecture – including its most spectacular fixture: the 162-floor, 2,717-foot Burj Khalifa skyscraper – before a luxurious dinner cruise aboard the stylish Bateaux Dubai. Next, travel back in time to the Dubai of old on a private tour of the spice-scented souks of Bastakia, one of the city’s oldest neighborhoods. Later on, get the royal treatment at the Dubai Desert Conservation Reserve, where you’ll embark on a Range Rover-assisted desert safari before settling in for a luxurious starlit six-course dinner around a blazing bonfire. (Henna tattooing, private belly-dancing performances, falconry demonstrations and more can be added to the experience, too.) Next stop: oil-rich Abu Dhabi, where you’ll be treated to a privately guided tour of the white-marble Sheikh Zayed Mosque, the third-largest mosque in the world, and have the chance to explore the city’s other fascinating sights, including the Gold Souk, the historical Heritage Village, and take lunch at the extravagant Emirates Palace Hotel. Finally, take a full day to yourself and take advantage of the city’s limitless possibilities before leaving the Emirates behind for adventures elsewhere. For your added comfort, an English-speaking assistant will be waiting for you at the arrival gate holding a sign with your name on it. You will be assisted through immigration, airport security, and a dedicated fast track counter. Porter service is provided at the luggage belt area only. You will also receive a voucher for access to the Marhaba departure lounge at this time. 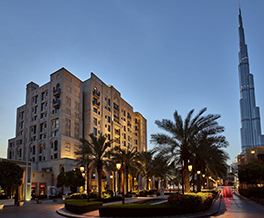 Manzil Downtown Dubai is an upscale boutique hotel that presents a perfect fusion of old and new. The property is just minutes away from Burj Khalifa, the world's tallest tower which is the central focus of the world famous downtown commercial and residential precinct, as well as the spectacular Dubai Mall, hailed as the world's largest shopping experience. Distinguished by a unique palette of brown, beige, and white, Manzil Downtown Dubai will features guestrooms intricately designed to provide a warm and embracing welcome for visitors. Modern Dubai offers visitors a diverse experience from the unforgettable charm of traditional souks to inspiring modern skyscrapers. 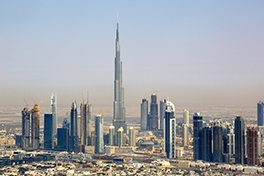 This tour starts with the world's tallest building, the Burj Khalifa [pictured at left], situated right next to one of the world's largest shopping malls, the Dubai Mall, where you will have the opportunity to experience “At The Top.” Begin your vertical ascent to the observation deck in a high-speed elevator, traveling at 10 meters per second. As the doors open, floor-to-ceiling glass walls provide a breath-taking unobstructed 360-degree view of the city, desert and ocean. You will visit the 50m long, designed to a world class standards aquarium, and experience the exotic wonders of aquatic life first-hand through breathtaking views. Traveling through these, you will be treated to an exceptional underwater experience as you meet eye to-eye with sharks, stingrays and other species of fish in their natural habitat. Next you will head towards Dubai Marina district, which offers an exclusive environment for living, leisure and business, only to be followed by the world`s largest man-made island, that has captured the world's imagination with its magnificent scale and ingenuity, called The Palm Jumeirah. A brief photo stop opposite the luxurious Atlantis, The Palm Hotel, offers a magnificent, oceanic tribute to a mythological age. A vast water scape, Atlantis, The Palm is a place of sunken aquatic chambers, submerged ruins, and exhilarating water rides. To conclude this unforgettable tour, you can enjoy the experience of having “High Tea” on the 1st floor of the only 7-star, world famous hotel, Burj Al Arab. Designed to resemble a billowing sail, this architectural marvel soars to a height of 321 meters, dominating the Dubai Jumeirah skyline. Illuminated at night by choreographed art-light, representing water and fire, Burj Al Arab is simply individual, inspired, and impressive! 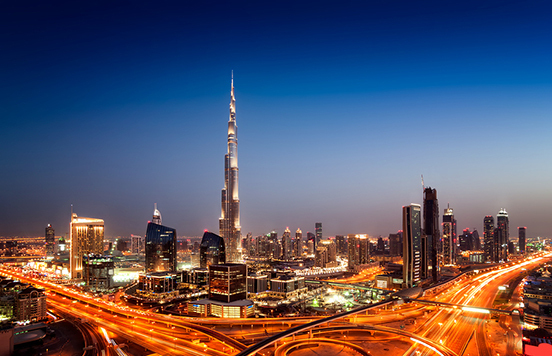 To experience the ancient City Tour of Dubai, the route takes you past the highest buildings in the Middle East. After a short break by the Creek we arrive to the oldest part of the city, Bastakia where old wind-towered houses of wealthy merchants are still to be seen. 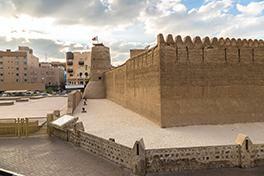 Close by we visit the fascinating Dubai Museum in the Al Fahidi Fort [at right], which has been there almost for two centuries defending the settlers of early days. We continue our tour through material market taking a closer look at the wind-towers on our way to Abras, local water taxis that will take us across the Creek to the area of spice and gold souks. As the final destination of this four hour tour we will walk through the bustling alleys of these souks being amazed by mystical aromas of numerous spices and the breath-taking amount of dazzling jewelry varying from traditional to the latest designs at amazingly affordable prices displayed by almost 200 shops. This tour includes a private vehicle and driver for transfers to sites and return trip to hotels. Step aboard the Bateaux Dubai for an exceptional cruise experience, which will take you past Dubai's most inspiring sights in glass-enclosed splendor. A mesmerizing cruise on the Bateaux Dubai will give you the unique opportunity to experience freshly prepared gourmet cuisine from the a-la-carte kitchen onboard. This tour includes a private vehicle with driver, which will transfer you from your hotel to the cruise, and return you back upon completion of the cruise. Abu Dhabi is the capital of the United Arab Emirates and residence of the Federal National Council. One of the world's largest producers of oil, Abu Dhabi, has actively attempted to diversify its economy in recent years through investments in financial services and tourism. On your tour today, you will be mesmerized by the grandness of the new addition to Abu Dhabi's sky line, the majestic Sheikh Zayed Grand Mosque - the third largest mosque in the world. Delve into the architectural and spiritual majesty of this monument as you discover its splendor with your expert private guide. Whether you're a shopper or not, don't forget to visit the Abu Dhabi Gold Souk. You can try your haggling skills here or simply take in the sights that this unique market offers. Then visit the Cultural Foundation in the heart of the city, next to the famous Union Square, that gathers symbolic themes inspired by the customs of the country. After a drive along the Corniche, the tour makes a visit to the Heritage Village, specially designed by late Sheikh Zayed Ben Sultan al Nahyan, as reminder of the past for the younger generation. To conclude, enjoy lunch at one of the most luxurious and unique hotels in the world, Emirates Palace Hotel. With a blend of contemporary style and comfortable furnishings, Traders Hotel, Qaryat Al Beri, Abu Dhabi is ideally located in the Qaryat Al Beri complex. Ideally located in the Qaryat Al Beri Complex, the 301 well-appointed rooms and suites at Traders Hotel, Abu Dhabi, are designed to provide guests with a comfortable stay. Relax and rejuvenate in contemporary, spacious rooms, featuring stylish décor with warm tones and comfortable furnishings. These rooms are fully equipped with features to make your stay memorable and productive. Spend the day at leisure. 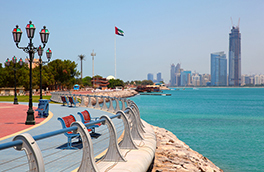 Abu Dhabi features a great variety of leisure activities, both indoor and outdoor. 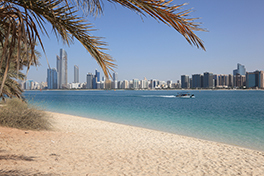 Sporty or lazy, in the city or out in the desert, on land or on the water: whatever you feel like doing, you can probably do it in Abu Dhabi. OR choose optional activities: Yas Driving Experience or a Sea Cruise trip with transfers, the choice is yours! 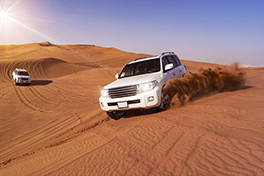 A private vehicle with an English-speaking driver will provide a transfer between the Abu Dhabi Airport and Dubai. Cost does not include airfare ( we are flying from Los Angeles ) or cancellation insurance. OR To pay online with PayPal, make your payment to avivatravel@aol.com. OR To pay by credit/debit card, complete the information on the form and fax it to 630-559-8845. Or you cand scan the form to your computer and email it to avivatravel@aol.com.